Last weekend, Justine and I did just over 45 km of hiking in the Whistler backcountry. We started out at the Cheakamus Lake parking lot, and through hiked out to the Garibaldi Lake parking lot, over an amazing four days. I'll do a proper post, but in the meantime while I get through all of my photos, here's a map of the trip. We had done part of this hike the second week of July. 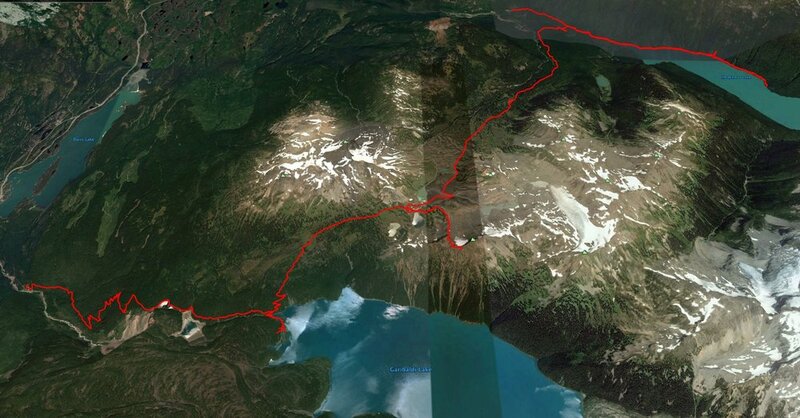 Here's the before and after near Garibaldi Lake. Second week of July on top; Labour Day weekend on the bottom. What a difference a couple of months makes!